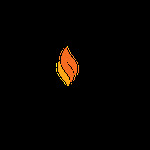 One of the greatest simchos for a community is to receive a new Torah. 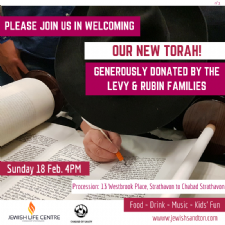 Thanks to the generosity of Brett & Mark Levy and Steven, Evan & Ilan Rubin and families, we will PG welcome a brand new Torah from Israel to our community on Sunday, 18th February. One unique aspect of this Torah's journey is that a number of people battling various illnesses have had the chance to write a letter in the Torah. The donors wanted to give people the chance to bring additional brocha into their lives through the Torah, and we hope these brochos will be fulfilled. We'll start the event with the writing of the final letters of the Torah at the home of Dean & Sara Abro at 4pm. We'll then proceed by foot, accompanied by music, up Gayre road to the Shul. Upon arrival, we bring out the existing Torahs to welcome the new Torah. We continue with a Simchas Torah-style celebration, with a live band. We'll have snacks and kids' entertainment. It is a big deal to kiss a new Torah on the day it is inducted into a Shul, so make sure to have a chance to do just that.